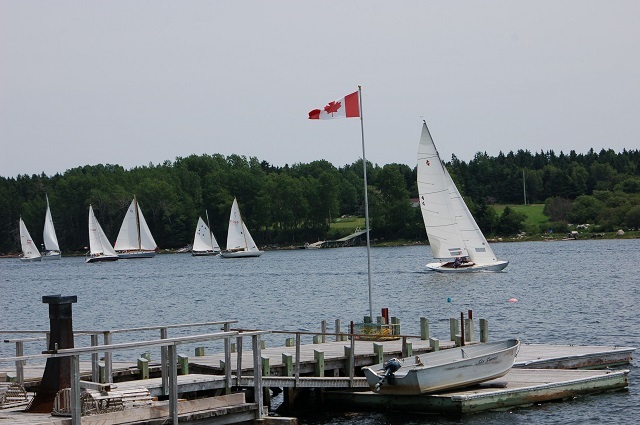 Canada Day on the South Shore was hot, about 30 degrees, but with a brisk southwesterly wind - perfect for sailing. Almost twenty boats set out from Indian Point when the signal sounded at 1:30 and then tacked their way behind Gifford Island on their course around the islands. Their destination was Martin's River, where the race ended at 3:30 and, in the evening a wonderful concert was held at the Levy/Conrad dock. Entertainers included Brian Bourne and Christine Campbell. Mr Bourne played several stringed instruments including a Chapman Stick, a unique stringed instrument. He also played a zither, to add to an impressive performance. He was followed by Ms Campbell, who dazzled the crowd with her guitar prowess and singing. Her voice was full and rich, with shades of Janice Joplin and indeed she ended her concert with the Joplin classic, Me and Bobby McGee. Midway through, awards were given the top three in each of the classes of race participants - Class A for boats under 20 feet and Class B for those over. John Meisner, Chair of MICA, ended the evening with a heart felt thank you to Pat Nelder and Mike Kelley of the Indian Point Yacht Club and to Wendy Levy and Terry Conrad, concert organizers and hosts. John also recognized the musicians, sponsors and helpers who made the day so successful for MICA. It was a wonderful day of racing, entertainment and camaderie with proceeds going to MICA and, in John's words, we hope to see it happen again! The Mahone Islands Conservation Association (MICA) presents an Island Fun Yacht Race on July 1st for boats of all sizes around some of their favourite Mahone Bay Islands. After a fun day racing, come to a live concert in support of MICA in Martin's River! Summertime just brings out the music in people and the music brings out the people! Bring your boat and moor, anchor or dock. It will be a great spot for you and your crew to enjoy the music. Listening to music outdoors, the music becomes part of the natural landscape. Or... bring a blanket or a chair so you are free to kick back, relax and enjoy on the front lawn. Tickets are available on-line or at the event. Click the links below for detailed information to register for the race and about the great concert featuring Nova Scotia musicians.